Even though summer days are long, they tend to be full. Maybe you spend a little longer with your toes in the lake. Maybe you take the longer trail through the wildflower patch on your way down the mountain. Maybe you unexpectedly spend two hours washing your dog repeatedly after she coats herself in rotten elk poo. Whatever the reason, some days require easy meals. 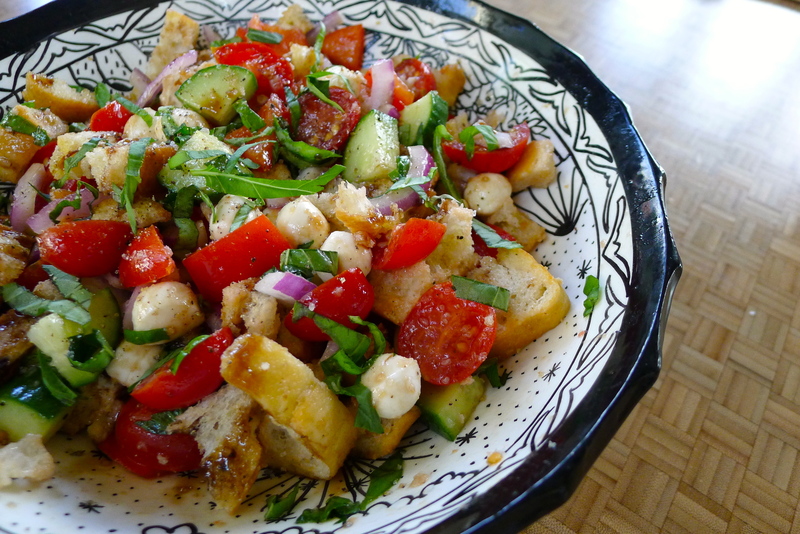 I’m always on the hunt for quick, minimal-effort dishes for those crazy days, and this fresh panzanella salad fits the bill. 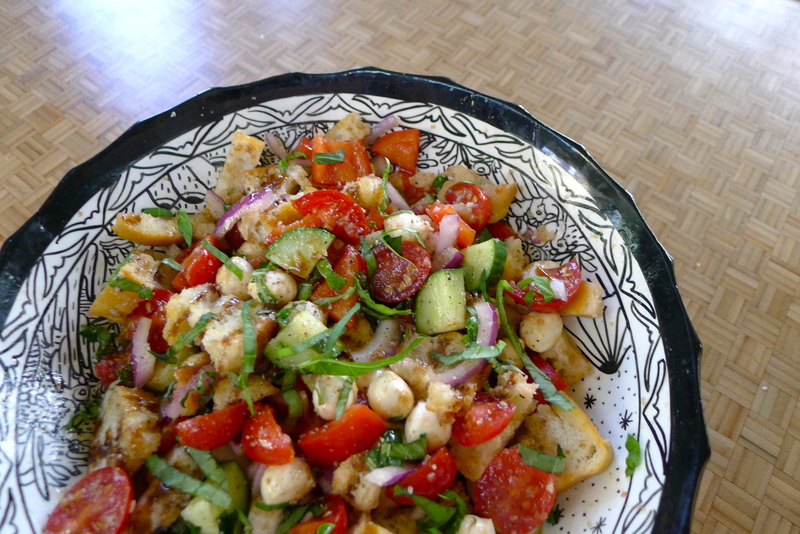 There are many variations of panzanella salad. 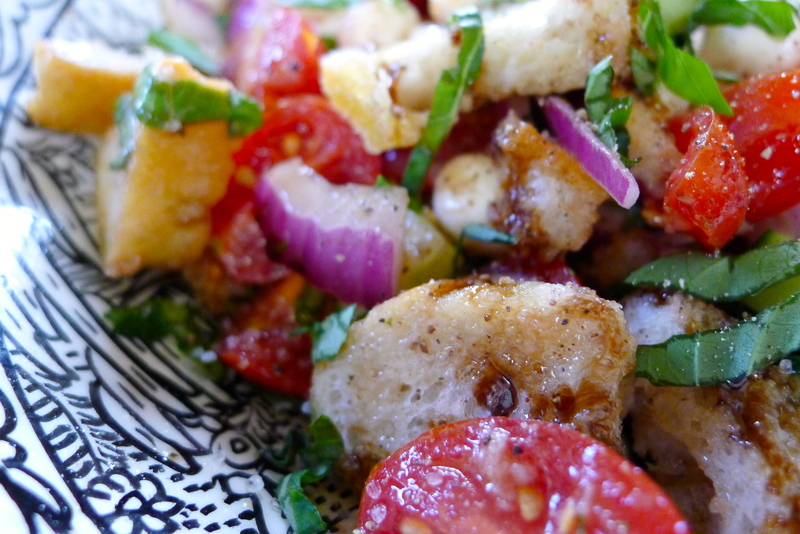 It was originally a way to use up stale bread by soaking it with tomatoes and oil, but modern versions have all sorts of good stuff in them. 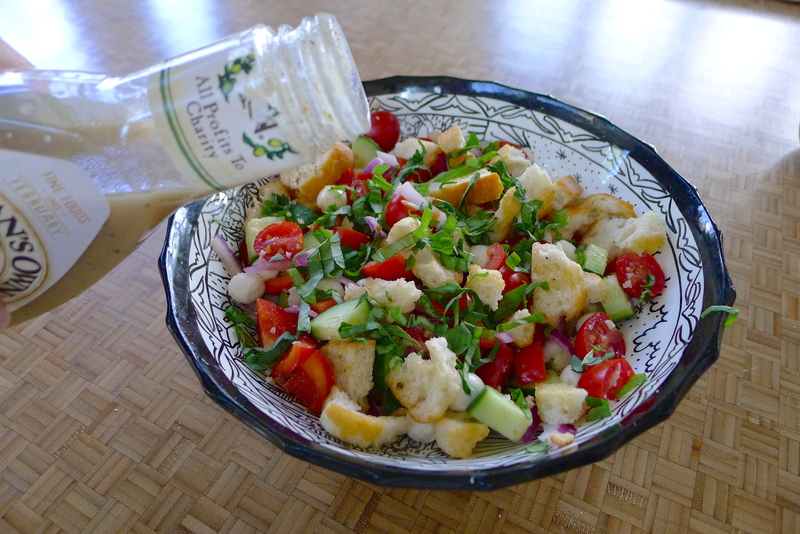 I’ve shied away from the idea of a bread salad before because I can’t get past the possibility of it becoming soggy. Yuck! But when I tried it, I loved it. Fresh, crisp, light and hearty at the same time- all of the things you want a summertime side dish to be. I started by cutting some sweet and juicy cherry tomatoes in half (yay summer!). 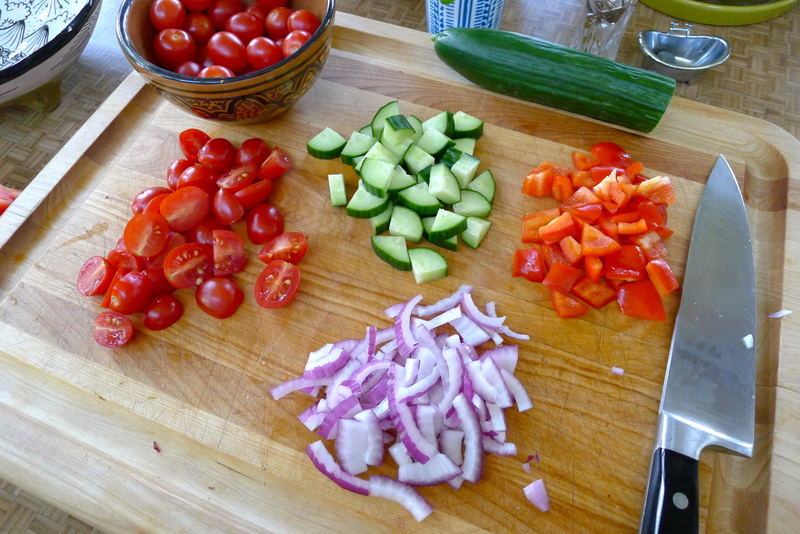 Then I chopped some fresh veggies into bite-sized pieces to add texture and flavor: crisp cucumber, red onion, and red bell pepper. Any veggies would be delicious! 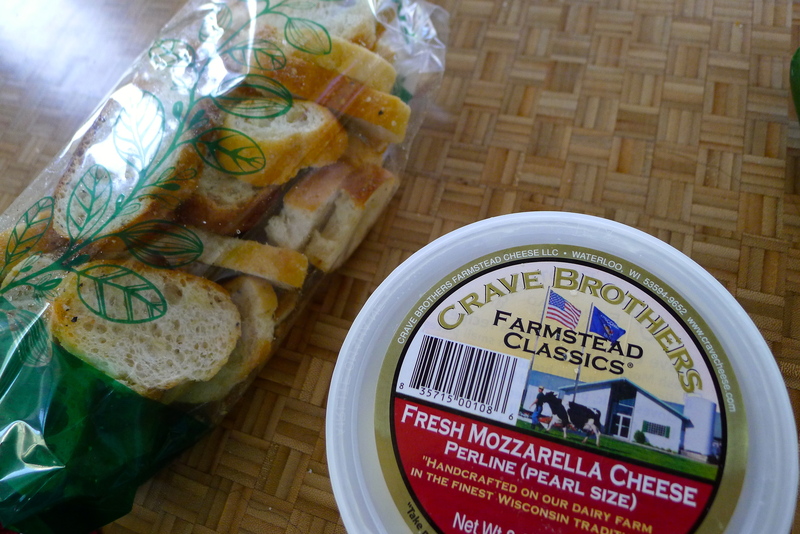 Usually, I’d probably cut up some good bread, season it, and bake it to make tasty croutons. 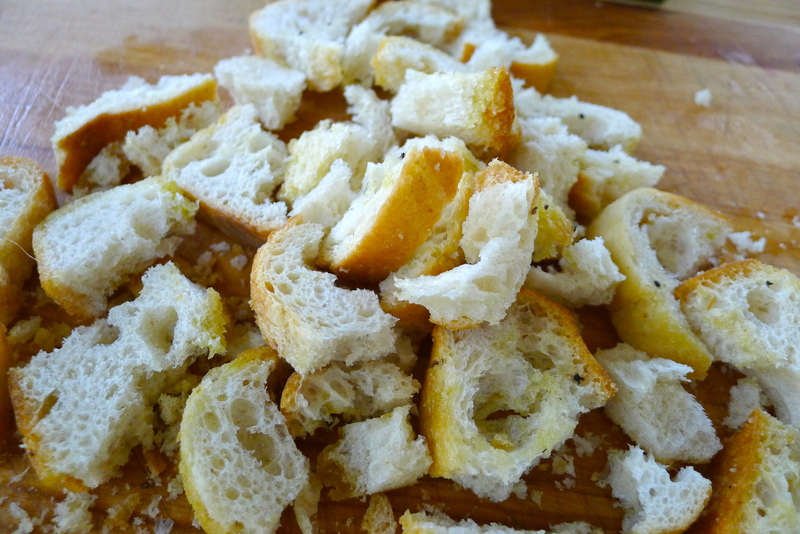 To save time, I picked up some pre-made toasted baguette slices and crumbled them into chunks. 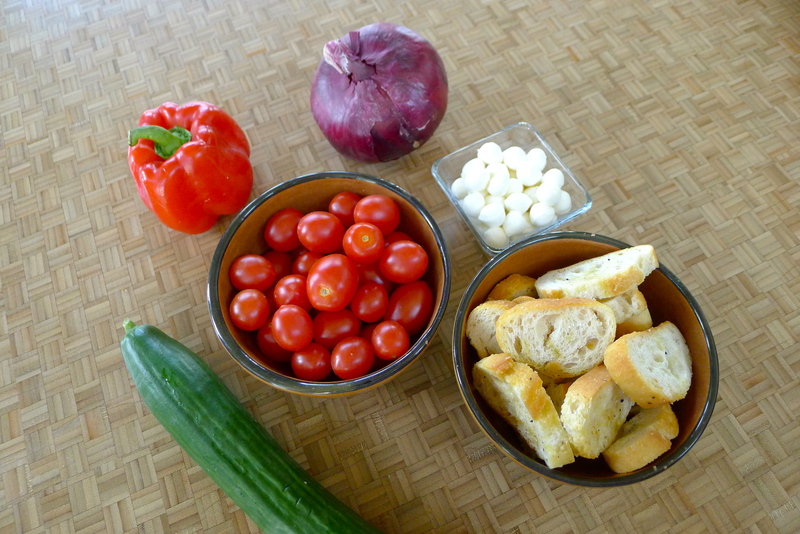 The tomatoes, veggies, and crunchy toast bites went into a big bowl together. 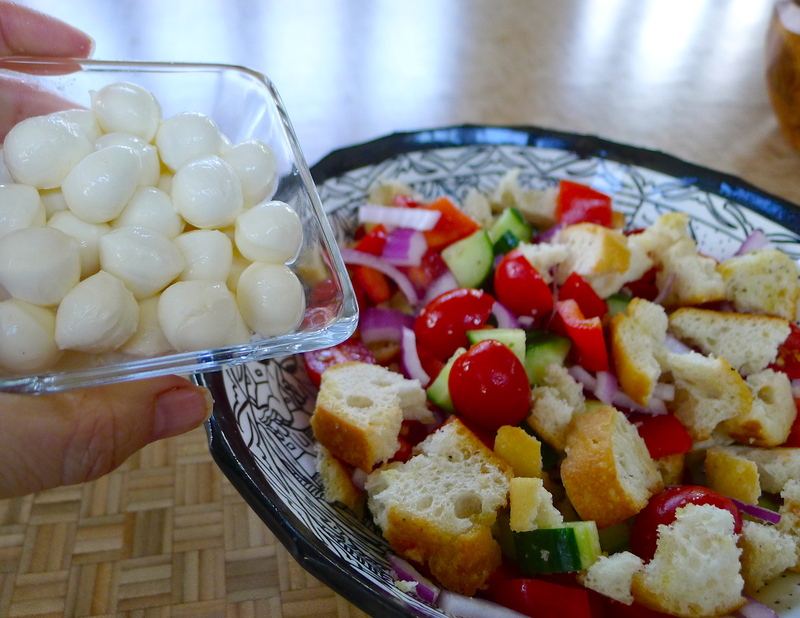 To add a creamy texture to the salad, I added mini mozzarella balls. Any cheese cut into bite-sized pieces would work. So easy! I added some fresh basil before dressing the salad. 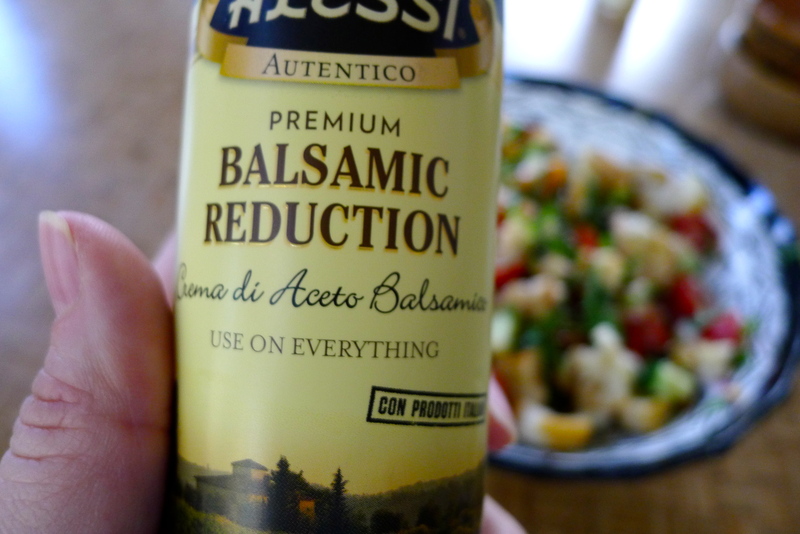 Again, in the interest of time, I just used a premade Italian dressing, and also drizzled in some sweet balsamic reduction. A pinch of salt, a sprinkling of pepper, and a good stir- that’s all there is to it. 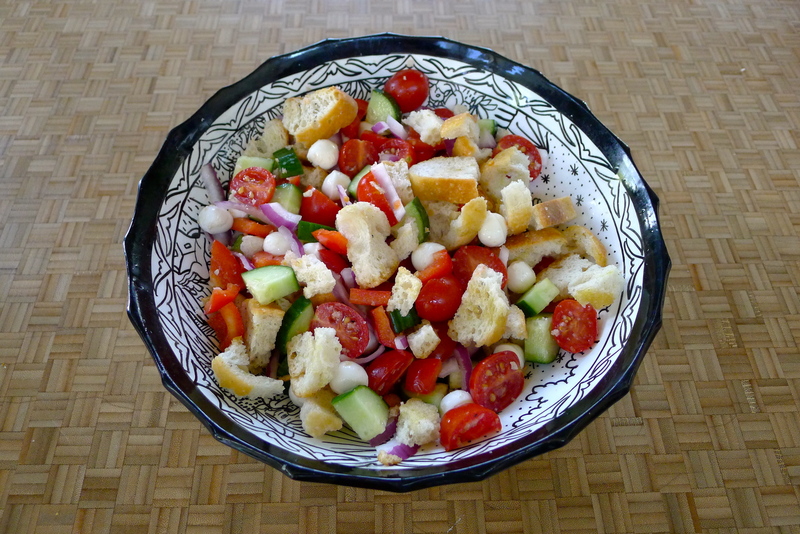 The trick with a panzanella salad is to let it sit– let the croutons soak up a bit of the juice from the tomatoes and the dressing. Trust me- it won’t get soggy! I covered my beautiful bowl and set it in the fridge for a half an hour until dinnertime. I gave it another good stir before serving. Beautiful! 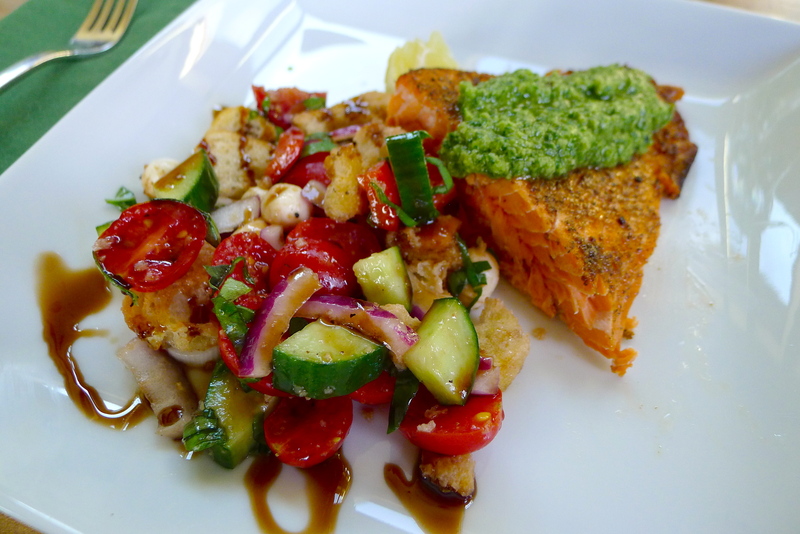 We ate ours alongside grilled salmon with an arugula-avocado pesto. 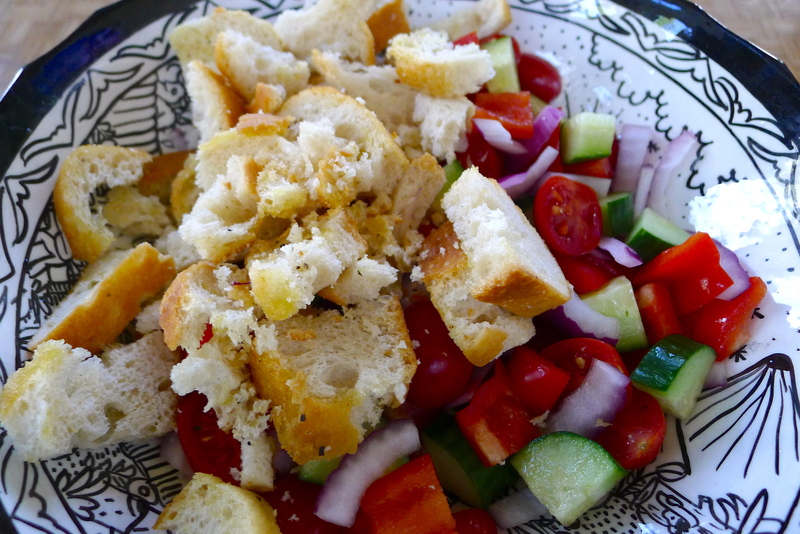 It was light and flavorful, with plenty of crunch from the raw veggies and non-soggy bread. 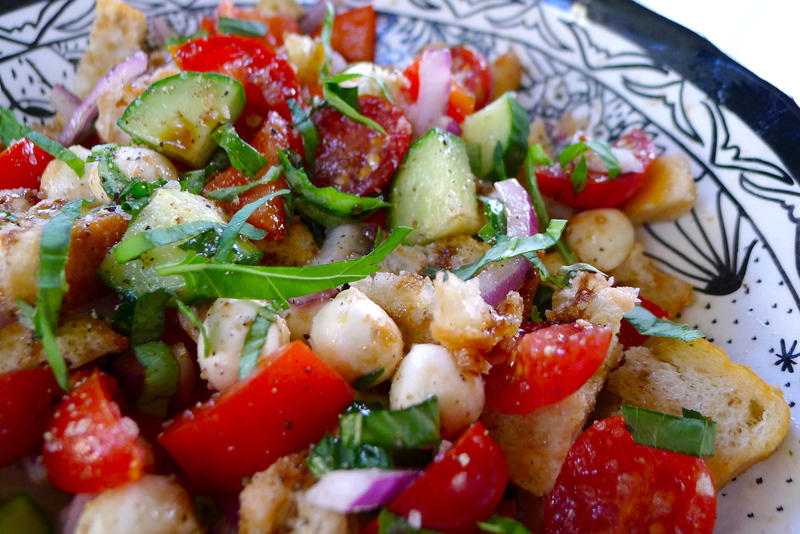 What a perfect summer side dish! It took no time at all, and fresh, homemade food is always better than take-out, right? Yum. Combine all ingredients in a medium-sized bowl and stir well to combine. Cover and refrigerate for 20-30 minutes, then stir well before serving. Adjust dressing as needed. Note: This salad doesn’t keep well, so eat it all! Cheers to easy summer dishes and clean dogs. YUM! One year ago: Jackson Breakfast Burritos. Next postA long, lazy weekend in Durango.